Provided by Ed Moran Freshman Aziza Chigatayeva took the women’s 3,000-meter steeplechase at the Colonial Relays and likely solidified a spot in the NCAA East Regional Meet. The rain in Williamsburg, Virginia was not enough to slow down freshman Aziza Chigatayeva, who has likely solidified her spot in the NCAA East Regional after her impressive performance at this weekend’s Colonial Relays. 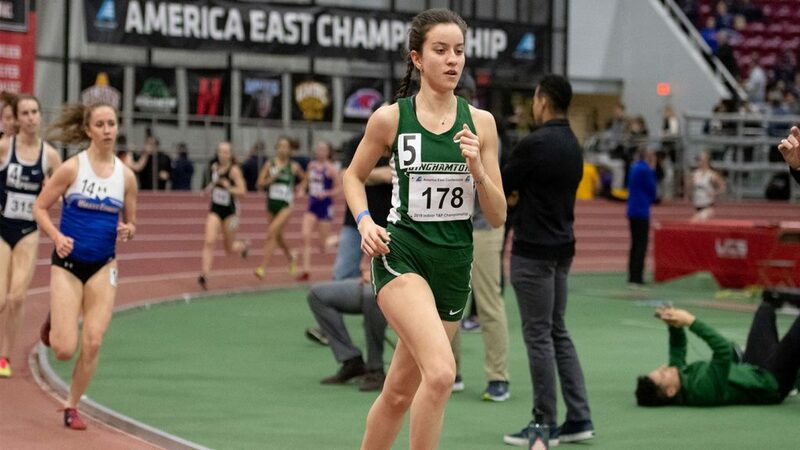 This meet, which was hosted by the College of William & Mary, marked Chigatayeva’s first time competing in the 3,000 meter steeplechase, and she did not disappoint. Overall, the Bearcat women finished 10th out of 38 teams in the competition, while the BU men’s team finished in 16th place. Chigatayeva, a freshman hailing from Brooklyn, finished first out of 34 entries, clocking a time of 10:26 to not only take first prize, but to also smash the previous school record by over 20 seconds. Her time currently ranks No. 13 overall in the East Region. The top 48 performances at the end of the season will earn a spot in the NCAA East Regional, which will be this May in Jacksonville, Florida. While Chigatayeva had the most notable performance of the event for BU, several other Binghamton athletes found success. On the women’s side, junior Elly Scherer secured a second-place finish in the 100-meter hurdles with a time of 14.22. Graduate student Brooke Bonney finished third in the hammer throw (165-0). Junior Emily Mackay also broke a school record in her 1,500-meter run performance, which nabbed her a fourth-place finish in the event. Her time of 4:31.25 broke Alexis Hatcher’s 2015 record time of 4:33.11. On the men’s side, junior Matt Baker placed second in the men’s triple jump (48-4). Fellow junior Greg Matzelle finished third in the men’s 100-meter dash (10.77). As the outdoor season continues, Thompson knows there is plenty of room for improvement on the team despite the success that the team found in this event and throughout the indoor season. The Bearcats will be back in action next weekend when they travel to Bucknell University for the Bucknell Outdoor Classic, a two-day event. The meet will take place Saturday, April 13 and Sunday, April 14 in Lewisburg, Pennsylvania.